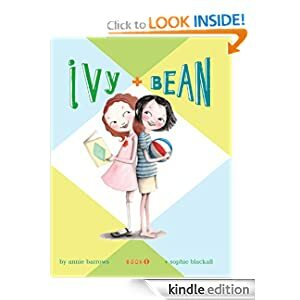 Today Amazon makes discount for Ivy and Bean 1: Bk. 1. Yesterday this book costs $4.99. Today price is $0.99. It is good chance to attract your child (from 6 to 9 ages) to reading books. In the series, Ivy (a quiet, intellectual child) and Bean (a rambunctious child) become fast friends despite their differences and their initial reluctance to like each other. They are both 7 years old in the series, and live on a cul-de-sac in a suburban environment. In this first book in Annie Barrows’ bestselling series, young readers will meet Ivy and Bean–a dynamic duo like no other. The moment they saw each other, Bean and Ivy knew they wouldn’t be friends. But when Bean plays a joke on her sister, Nancy, and has to hide quick Ivy comes to the rescue, proving that sometimes the best of friends are people never meant to like each other. Vibrant characters and lots of humor make this a charming and addictive introduction to Ivy and Bean. “It is hard to find books for younger readers that combine silliness, mischief, friendship, authenticity, and common sense. It’s even harder to find ones that don’t have an undercurrent of hip irony, or, even worse, some odd note of sourness. The Ivy + Bean books manage to hit this sweet spot remarkably well. Bean is the designated cut-up, but she is usually saved by a good sense of what is fair and allowable. Ivy is supposedely the long suffering “good girl”, but she can get carried away by a mischievous streak, that can surprise Bean and the reader. So, we get a much more balanced team of friends than is usually the case, and a lot more opportunity for each character to be more than just a predictable “type”. Additionally, secondary characters, (parents, siblings, teachers, schoolmates), are not just stock figures, but develop actual personalities and contribute to the momentum of the various stories. This adds a lot more depth and variety to the books than one would normally expect. This book worked as an attention-holding “read to” with our five year old, and drfited into a “read with” and then “read alone”. That made it a wonderful transition book to independent reading. “My six-year-old daughter loves to read and has recently started reading chapter books. Once she got over her obsession with the Junie B. Jones series, I managed to get her interested in the Cam Jansen series of books and then I discovered the Ivy and Bean series. My daughter loves the central characters, Bean and her best friend Ivy. The girls are precocious, intelligent, and always up to some adventure (or misadventure, depending on how one looks at it!). These traits appeal to my daughter as she is quite the adventurer herself, and the chapters are relatively short, which makes it easy for her to read independently. The books average about 100-120 pages, and she manages to read up to 40 pages per sitting (around 45 minutes). What I found to be fascinating was that the plot for each story is so well-written and developed that my daughter could not stop once she started reading! I usually sit with her and supervise her reading, helping out with some difficult words, and she gets so involved with the story that she just keeps on reading. This to me is the mark of a good book, one that entices a young reader to keep reading. The language is not dumbed down, on the contrary, there are some challenging words which I help my daughter with (pronunciation and definition, if necessary). This entry was posted in Kindle Books, Kindle Daily Deal and tagged Annie Barrows, Ivy and Bean by Paul. Bookmark the permalink.